This is a solid finely crafted two tone stainless steel magnetic bracelet. This magnet bracelet is styled in brushed silver with shiny accent 18k gold lines, and is about 1/2" wide, and has a powerful & permanent 3300 gauss neodymium rare earth north facing magnet in each link. This is the third one I have had and it is great! My husband is pleased with the 2 bracelets I bought for him. He wears them every day & no longer experiences the tightness in his hand. PURCHASED THIS ITEM FOR MY HUSBAND WHO HAS ARTHRITIS IN HIS WRISTS AND HE LOVES HE. HE HASN'T TAKEN IT OFF SINCE I GAVE IT TO HIM. , but still works to stop the arthritis pain in my thumb. Excellent product and service as always! The bracelet is exactly what I hoped it would be, in every respect. Every aspect, from the service and delivery time to the merchandise was excellent. I award the overall experience five stars. I brought this product because of a recommendation from my coworker who purchased one for her husband. My wrist no longer has the level of the pain it once did. I love it!!! While the pain is not totally gone wearing this bracelet has subsided the pain to a very minimal. The price was great and I will purchase another one. Also I love how it looks! It's fancy and makes a statement! Very pleased with bracelet, very good price and excellent fast shipping. I love it. My wife and I love the items we purchased from you and plan to shop with you again soon. I love this bracelet, good quality and stylish, by following your sizing instruction I have a perfect fit. Very happy with the bracelet fit was good and price was right. Give for wife. She loves it. Great product, looks great and priced right. Will recommend product and company. Very pleased with the product, service and price of the 2-tone magnetic bracelet. This is my 2nd magnetic & I d know they relieve joint pains. Thank you. I have been wearing my bracelet for a week now and have seen some improvement!! It is very stylish looking and good quality!! I got 2 of these and I wear one and Husband wears one, they are helping with hand pain from arthritis and theyn look really nice as well. I am pleased with the bracelet. Will be happy to recommend others to your site. Pain in lower back seems to be less than before my purchase. Very satisfied. Bracelet is very well constructed and is well fitted. This is the first magnetic bracelet I have purchased and anticipate purchasing additional bracelets for gifts. VERY SATISFIED WITH THE BRACLET, THIS IS THE SECOND ONE FROM YOUR COMPANY. I've been wearing a magnetic therapy bracelest for around 15 years. The bracelet has been a tremendous help in managing my pain, especially in my hands. I don't know exactly how they work, but they do. Unfortunately the wore I had broken and I needed a replacement. I bought this one from Magnetic Jewelry Store because of the strong magnets. After wearing it for about a week I noticed significant pain relief in my hands. This one is the best magnetic bracelet I've owned. The product arrived as promised, in good shape and on time. I have received a lot of compliments on it as just a bracelet due to its sharp looks. It was also sized correctly and has powerful magnets. I have been wearing it for about 2 weeks and it seems to help an elbow injury. Thanks for the great product and great price. I measured my wrist EXACTLY as the directions said and it's TOO big. I have to have a link or two taken out so it will fit properly. Reply By MJS: I am sorry, but apparently you really ordered the wrong size. We are glad to help. If you have the wrong size, you must have measured your wrist incorrectly. We ask for your wrist size and we then make the bracelet a bit larger than your actual wrist size so it fits comfortably. Please re-measure your wrist and let us know. We are glad to arrange re-sizing if you wish. Please let us know. Came quickly, fits well looks sharp! My body is still in pain but, only have worn this bracelet for ten days now. Weather it works or not it still looks sweet! I received my braclet 2 weeks ago and I can't tell you how much it's helped with my shoulder/neck pain. Absolutely amazing. I will be ordering another very soon. I bought this item with the copper bracelets and feel that I get better pain control from the copper. This bracelet does look good when I wear it. I bought two bracelets for my husband and myself. Both of us have frozen shoulders that just ache. He likes his bracelet but hasn't had the relief I've experience. But he still likes just wearing it as jewelry. Referred to this type of jewelry by a friend and was skeptical about the results that I was so excited for it to be delivered and try it on. I have NOT taken it off since the day it was delivered (except for showers). I have become an advocate with family and anyone who compliments the bracelet. I stand wholeheartedly by this product. I purchased this for added energy and less pain. I run over 5 miles each day and lift weights. Literally, the pain in my knees, elbows, ankles, shoulders and wrists have dissipated. I have more energy without supplements and it is truly an unbelievable product!. Reply By MJS. We are so glad to hear this. Please note, customer also suggested reading the info included with orders. My sincere congratulations for not only selling and promoting in good taste, a fine product, but for exemplary service after the sale. My two experiences with you have been superior! You not only accepted one return and replacement due to MY measurement error, but had the correct one back to me within 5 days. We will use you again, so please do keep us on your mailing list. Six Star Rating!! X X X X X X! RELIEF and SATISFACTION, with a purchase from MagnetJewelryStore.com., that's how. My husband has just started using his bracelet. He has used a different brand in the past and was very happy with the various sizes you had available.... we just received it yesterday. I have since ordered a second one. Thanks! I got a simple 2 magnetic braclet to try to see if it would help with swollen, inflamed pinkie joint and carpal pain in my thumb..It worked like a charm, so when my other hand began to keep me awake at night with thumb pain, I decided to get the Stainless steel bracelet #39... I am so amazed that this has COMPLETELY taken all of the pain form my other thumb and wrist! I HIGHLY recommend magnetic therapy for this type of pain!!! Makes me feel better knowing I am not filling my body with needles drugs, too!! THANK YOU! THANK YOU!! THANK YOU!!!!!!!!! I must admit the bracelets do work,I have 3, I wear one on each wrist, I bought my first one for shoulder pain, it helped, so I purchased two more different styles, I decided I would sleep in them which I never do, but I had the best restful night in along time. I experimented and I dd not sleep in them, I did not sleep well, my arm was aching. I am a believer now, I only take them off to bath. Delivered in two days!!!!! Nice looking, great fit and exceptional fast service was delivered to home within 2 days from order. Keep up great work!!! Excellent quality, good fit and will be recommended..
this is one good looking bracelet, truly quality item.I had pain in both my right hand and wrist. when I am wearing the bracelet my pain is gone.it really works for me. Am very happy with it. feels good looks good. Not over priced. Magnets not as strong as my other one, but still very happy with it. I have been wearing my bracelet for over a week now and I am pain free - very pleased with how it looks and the results that I have felt. Thank you very much for everything.The service the beautiful bracelet. I bought it for my husband and love it. He is waring it for pain. Seem to work because he is not lamenting anymore. They fit this Bracelet perfectly. Magnets are great for your health. The guys like them and they look very nice. I can't say anything bad about our experince of ordering them or the quality. I am pleased ,but my son liked it so we have since ordered two more. So far he hasn't noticed a change, except he is sleeping better. He's only been wearing it ten days though. I gave this bracelet to my husband who usually wears one but his had broken so he had not worn one for a while. He was so excited to get one back on his wrist. It did not take him long to feel results. This bracelet is also very good looking. The company impressed me with being concerned that I got the right size. We are both very happy. Very nice looking and does wonders. I wear this on my left wrist because i have learned that the left side works for the lower body and the right wrist works the upper body. For years Ive wore a copper bracelet on my right wrist for pain in my right wrist. wearing this on my left has taken the pain away from my right hip which has 15 pins holding every tging together. along with no pain in my right wrist. You will not be disapointed in this purshased!! I am very pleased with magnetic bracelet I received. Nice looking.... Great buy, many complements. Exceeded expectation. Nice looking - good quality - he loves it. I ordered one and liked it so well I ordered a second. They are well made and very attractive...everything as advertised. As a bonus, the folks at Magnet Jewelry are great to work with. This is the second one of these I purchased. The first one I purchaded I liked so much and it worked so well that I had to have another for the other hand. The Magnet Jewlery Store not only offered the best price on the market but one of the best - if not THE best - product available.It is attractive, functional, made from quality material and fits well.Thanks!!!! I am very impressed with your products. The quality is excellent and they do work as advertised. I have been able to stop taking medication for pain in my elbow and knee since I have been wearing the bracelet. I give your product a rating of 5. So beautiful!!! Looks great on a man's wrist. Very rich looking and does a wonderful job with relieving pain. This bracelet exceeded my expectation. From the look and design of this bracelet others would judge I have paid far more than the modest cost. I do believe the magnets makes a difference. I have been very happy with the excellent quality of the bracelet that I have recently received as well as the five that I gave for Christmas 2010. They are great value for the price and they have made a great difference in my physical health as well as those to Whom I gave them as gifts. You rank #5. I am very happy with all the jewelry I purchased from magnetjewelrystore.com..
Bracelet arrived on schedule and I have been wearing it ever since arrival. The bracelet is of very fine quality and fit. I take it off at bedtime because it seem to get too tight on my upper wrist. I would give five stars as a rating and would recommend your company to others. Your company was recommended to me by a friend my wife is looking into a bracelet for her. Reply by MJS: We are glad to re-size larger if needed and you wish. We ordered this bracelet for my husband and son. My husband wears it every day. We haven't heard from our son yet but suspect he will like his as well. Rating would be a 5. Thanks. This bracelet works wonders. It really helped relieve the pain in my elbow and looks good as well. Both my husband and I are enjoying our bracelets. He says his hand has not hurt as much since he has been wearing it. The bracelets are very stylist and seem to be of good quality. I've been wearing my bracelet on my right wrist and have found less to no pain in my wrist, elbow and shoulder which was due primarily to way too much computer/mouse usage due to my job and personal computer use. I took it off for a couple of days and noticed a bit more pain. Then I put it back and wear except for when I shower. I also appreciate the free and timely assistance of MJS in re-sizing the bracelet when I did not measure correctly. I love the bracelet!! In the past I only used the beaded bracelets and they are great too, This one is a lettle more to my taste. With the beaded I could more easily use a number of them to help with my pain. It would be great if one of the stainless bracelets was in a stronger magnet. 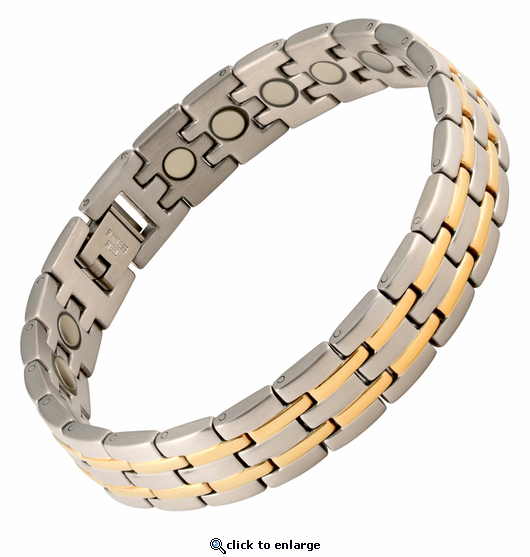 Reply by MJS: The stainless steel link bracelets have very strong 3000 gauss magnets. I am very pleased with the product. It has greatly improved the pain I have in my hands caused by gout that has plagued me for many years. i am very pleased with this bracelet. it is so distinguished looking that i hate to wear it when i am working in my shop because i don't want it to get scratched. but---i do wear it! i am thinking about ordering one of the hematite bracelets to wear while i am busy in my shop. so far, it does seem to be easing some of my many aches. many thanks! I always say You have to believe ---- From the first day, I have experienced very little arthritis pain, and I expect to wear this forever--- Have had severe wrist and knee pain and now it is gone ! Thank You. Love the bracelet and is very nice and comfortable to wear. What a great surprise! The bracelets (both my husband and I purchased the same style) are beautiful. With some trepidation we followed the measuring instructions, didn't add a bit to the circumfernce and were astonished when the bracelets fit perfectly -- as promised! So, super style, great fit, AND the pain has already reduced significantly after just two weeks. THANKS! I love it! This is the second magnetic bracelet I have owned. This one is better looking than the other one and feels great. The bracelet was shipped on time and is good quality as stated. Only problem, it was not sized to 7 1/2 as requested. I am handy and removed two links and sized it myself. Still would buy again from this store. Reply by MJS: As we state on our site we ask for your wrist circumference size(not bracelet size) and then we size the bracelet a bit larger that the wrist circumference size you select. You chose 7.5 wrist size so we then size a bit larger than that. That is why it is not 7.5. We are glad to re-size for you if needed. My husband opened the package immediately and put his magnetic bracelets on. He is thrilled to say he doesn't have numb hands anymore. He really missed his bracelet when he lost it and now feels the benefits even more than before! I love it! I owned a magnetic bracelet before, but by far this one is far more nice looking, and even more important more powerful in the benefits of pain relief. I highly recommend it. I love it! It was even better than I thought it would be. I haven't taken it off since the day it came in the mail. Fantastic fit and look! Great service too!